What is the cost of owning a swimming pool in Phoenix beyond the initial installation? As with any major investment, there is the upfront cost and then there are the upkeep, maintenance, and repair costs associated with ownership. You might call these "lifecycle costs." A swimming pool, like most things, will not last forever. But if you maintain your pool, keep the water chemistry balanced, and do some routine preventative upkeep, your swimming pool will provide years of trouble-free fun, enjoyment, and memories. Kevin Woodhurst, a professional pool builder in Phoenix, looks at what it costs to maintain an existing pool. First, nearly every pool is different, he says. Some pools are tunable, meaning they can be adjusted to find each pool's sweet spot, that perfect combination of good flow, little restriction, quiet pump performance, and low energy consumption. If the builder constructed it without the necessary adjustment capabilities, you have fewer choices. Here are some ballpark, sample costs associated with maintaining an existing pool, according to Woodhurst. Note that your pool maintenance costs may differ from those presented here as examples. The size of the pool, the equipment used, your particular water and electricity rates, as well as other factors will determine your actual cost of pool ownership. That said, the following breakdown and suggestions will hopefully give you an idea of how to calculate costs and possibly help you save some money. Energy usage with a standard 1.5 or 2 horsepower motor can be just under $100 a month. Many older pool pumps are oversized for the pool and draw a lot of energy. This is prevalent in old pools where the pumps were replaced with the mentality that bigger must be better. "Not true in this case," he says. Chemical usage could cost from $20 to $50 a month, Woodhurst says. As for water usage, the average pool holds 12,000 gallons. Every pool in the desert without a pool cover has an evaporation rate of 5 feet a year. For most play pools, it means that the entire volume of water is lost through evaporation. Of the 300,000 or so pools currently constructed in Phoenix, an estimated 20 percent of them may be leaking, which amounts to the loss of a volume equal to the water in 60,000 pools, Woodhurst says. What's more, if you have a filter that requires backwashing, you are literally "sending thousands of gallons of water down the drain," he says. "If every pool had a cartridge-style filter, we could save 1.5 billion gallons of water alone in Arizona. That is 4,603 acre-feet of valuable water," Woodhurst says. Your water bill will depend, therefore, on how efficiently you use water in your pool, coupled with the water rates charged in your community. A pool service company will charge anywhere from $50 to several hundred dollars a month to care for your pool. The average is probably about $100, Woodhurst estimates. "Make sure you know whether the charge includes all the chemicals," he warns. "Most people shop these guys for the price, which is not always the best method. Chuck in a Truck will always be cheaper than an established full-service company. The bar to get into this business is very low, as can be verified by the number of individuals coming into the industry and going out of business year after year. If the deal seems too good to be true...," he says. Anyone should be able to find information about specific pool service companies from the Central Arizona Better Business Bureau. Search for accredited "Swimming Pool Service and Repair" companies. There, look for companies in your city or zip code, see ratings and what kind of complaints might have been filed against companies, and find out how long companies have been in business. As for the cost of heating a pool, it is difficult to estimate because there are so many variables, Woodhurst notes. In the Phoenix area, the swim season is five or six months for adults, and possibly longer for kids. The options for heating include gas (natural and propane), electric heaters or heat pumps, solar, and other alternatives. Pool covers are great for extending the season without a heater, and they save on chemicals, evaporation, and cleaning. You'll use far less energy if the pool is not exposed to sand, grit, and dust. "Heating a full-size swimming pool all the time is out of reach for many of us, since that could cost from $300–$400 a month to more than $1,000 a month, according to Woodhurst. The total monthly ownership costs of a swimming pool are $100 or more every month, Woodhurst says. Still, he notes, "that's not for a backyard recreation facility that's available 24/7, 365 days a year." If you are building a new pool or renovating an existing pool, you have an opportunity to minimize your costs substantially by installing cost-saving equipment, saving energy, and adopting cost-saving practices from the get-go. Below are Woodhurst's suggested guidelines for building a cleaner, greener, more efficient pool. An in-floor cleaning and circulation system. There is no good reason to use a hose cleaner any longer. You would not buy a car in the desert without air-conditioning. Likewise, don't have a pool built without a quality cleaning and circulation system. This is the heart of the pool. "Over the years, an in-floor cleaning and circulation system will more than pay for itself compared to hose-cleaner repair and maintenance, chemical costs, and more, not to mention the hassle of taking a hose cleaner in and out of the pool," Woodhurst says. A multispeed pool pump. Install either a two-speed or a variable-speed pump, with the latter being the best choice now. Variable-speed pumps will save you hundreds of dollars annually for many years, he advises. A large capacity, cartridge-style modular media filter. The bigger the better. Opt to install filters that need cleaning maybe once a year. Commercial-grade, 700-square-foot filters filter from the top down, another very important feature. Note: Don't install this type of filter if you have dogs using the pool. A chlorinator. Use chlorine tablets rather than a floating sanitation dispenser, which is crude and not very efficient. "No matter what you have been told, a swimming pool in Phoenix in this heat will need some chlorine in it to stay safely sanitized and clear," Woodhurst says. A simple ozone system to cut down on chlorine demand. This will easily save you a couple hundred dollars a year, he says. A durable swimming pool interior. "Choose one that can handle some abuse and be forgiving when you make a mistake because that will happen," he says. It does not take much to ruin a plaster interior finish, he notes. Plaster is old school and dated, and the additives that enhanced its longevity are no longer used. "Consider an aggregate interior finish like Pebble Tec, Pebble Sheen, or Pebble Fina. At the very least, consider an enhanced plaster finish such as Ultra-Poz. If not, it may only be a few years before the interior will need to be refinished, and that is not cheap," Woodhurst notes. 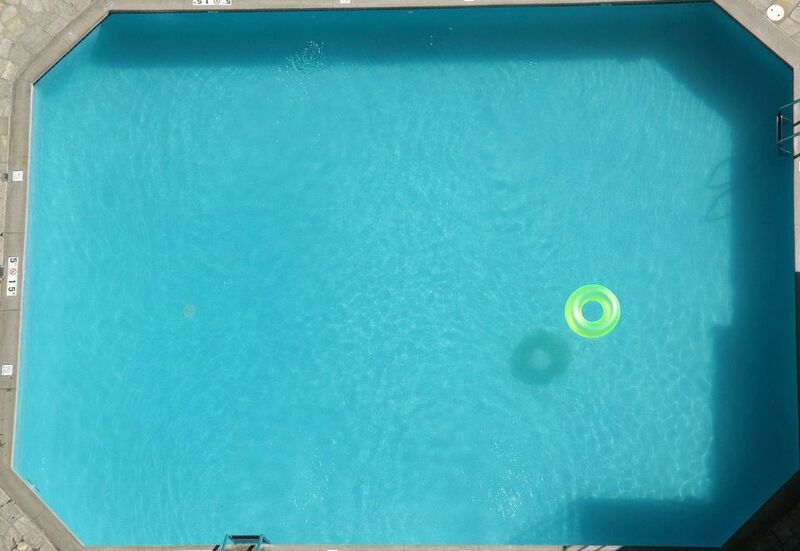 An automatic pool cover. This will save water, energy, and, therefore, a lot of money. It will also allow you to enjoy the pool nearly all year long. For renovations, all of the above should be considered. Adding an in-floor cleaning system is possible in an existing pool but is not economically feasible. Automatic pool covers are a tough retrofit but not impossible. It really depends on the pool design and deck configuration as well as obstacles in the way of raised areas and water features. Woodhurst notes that as a contractor, he is "very concerned about saving energy, using fewer chemicals, and the fact that we continue to fill our landfills up with construction debris. If you are proactive and spend a little more money now, your return on investment will be reasonable. You'll have lower energy bills and less chemical usage. Having an efficient pool will mean fewer repairs, less hassle, and minimal frustration" for swimming pool owners, Woodhurst advises.